I've named this necklace World Traveler I because it reminds me of something someone might put together after a trip to India and Western or Northern Africa, perhaps. It represents a mix of cultures with its Banjara tribal coin pendant (dated 1974) and rust-colored carved horn beads (that bring West Africa to mind). Rich red and warm gold wood beads balance the composition and earthy, turquoise and brown ceramic beads break up the red tones in the piece. 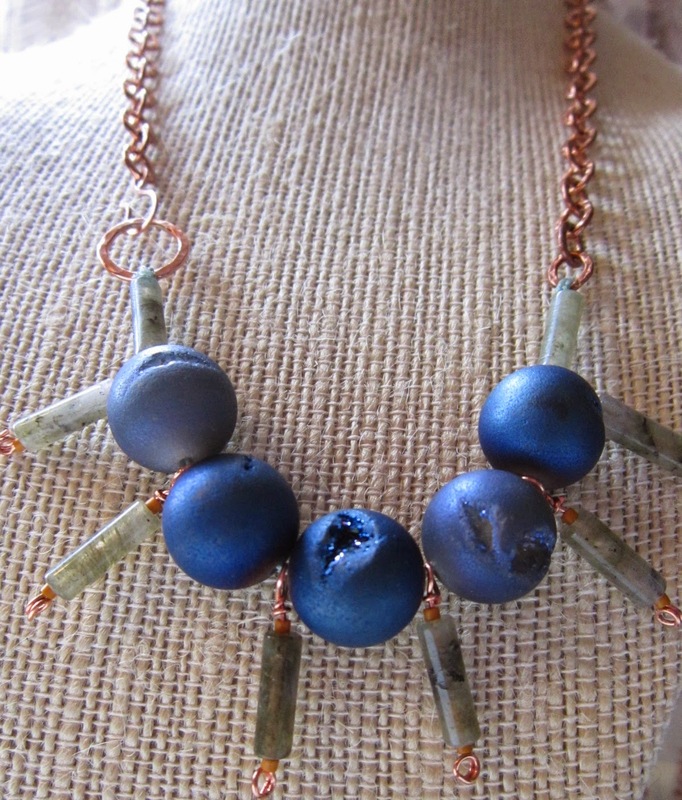 This necklace would be lovely on someone with a warm or neutral complexion, and would be a striking piece on someone with pink or cool undertones. To keep the necklace light, yet still make a dramatic statement, the top half is antiqued brass chain. I've added a brass clasp I hand formed and hammered and a tiny white-banded red agate to finish off the chain. The necklace is 18 1/2" (47cm) long including the clasp. The large bone beads are 3/4" (20mm) diameter and the coin pendant is just under an inch in diameter (24mm). See the pictures for close-ups of both sides of the coin and the clasp. The Banjara are nomadic tribal peoples of India (sometimes called the gypsies of India). You can read more about them and their culture on Wikipedia or many other sources. I love this necklace! Each one of dark blue druzy agate stones are a work of art. 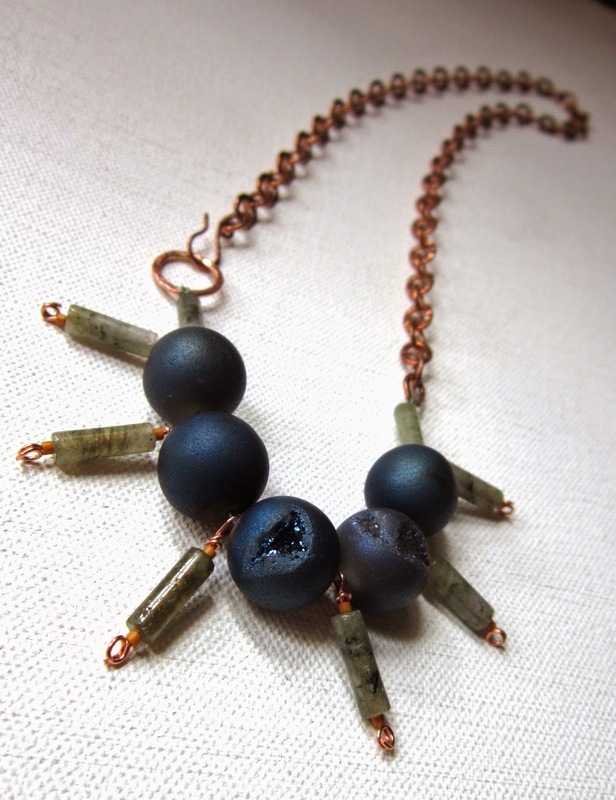 The labradorite tubes are framed between tiny mustard-hued delica seed beads; these along with the hammered solid copper chain and add a complimentary color note to the composition. 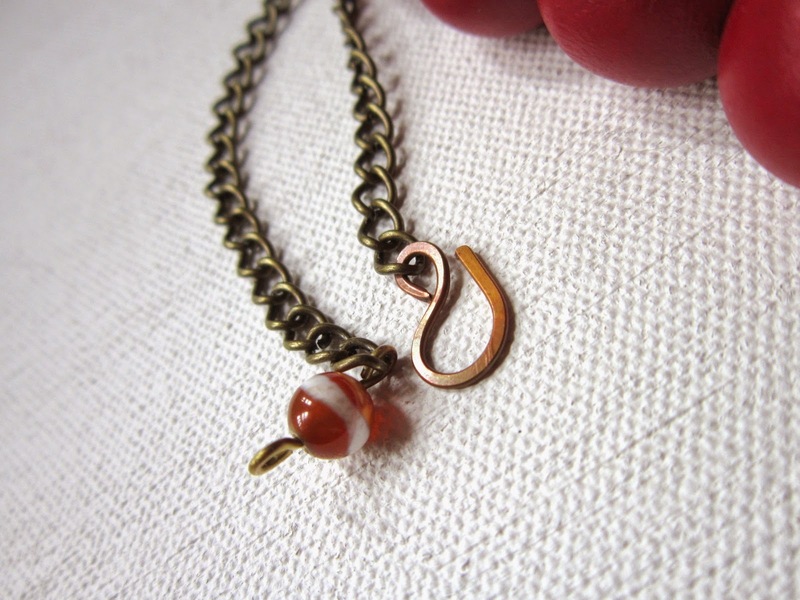 The copper chain is continuous (~14in/35.5cm) and the asymmetrical clasp adds interest. I hand formed and hammered the copper clasp especially for this design. Another touch of color is found in the aquamarine silkon cording the stones are strung on. This cord is strong and I've reinforced the knots with jeweler's glue. The necklace is 19 3/8" (49cm) total. The blue druzy stones are 9/16" (14mm) in diameter. The labradorite dangles are 5/8" (16mm) long.